St. Martin de Porres School hosted its fifth annual gala April 10 in support of the school’s mission to provide a quality education to students from the economically challenged North Philadelphia neighborhood. Presenting “Budding Scholars,” the evening was hosted by the Friends of St. Martin de Porres School at the Hilton Philadelphia hotel and featured a dinner followed by auctions and performances from students and alumni. 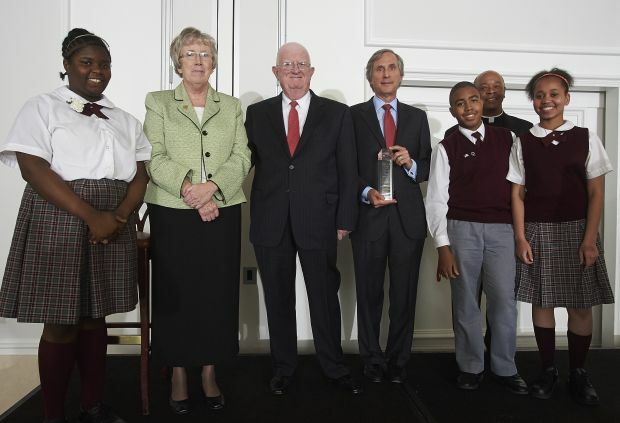 The 2014 St. Martin de Porres Award was presented to Jerry Sweeney, president and CEO of Brandywine Realty Trust, a long-time supporter of Catholic education and whose scholarship donations have helped dozens of students afford an education at St. Martin’s without financial strain. “I am both honored and humbled to have been chosen as the recipient of the 2014 St. Martin de Porres Award,” Sweeney said. “I truly believe that the ways in which the school prepares its students for high school, college and beyond sets them up for not only academic success, but for life success. The gala was made possible by several sponsors who not only donated money but also time and talent to help the school continue to advance its mission and improve its educational programs. With the support of the Friends of St. Martin de Porres School board, led by Jack Donnelly, and leading sponsors Brandywine Realty Trust, Carr & Duff, Land Services USA and Turner Construction, the funds raised at the evening’s events enable St. Martin de Porres to provide resources for students such as tuition grants, funding for new academic programming and computer technology, a reading specialist and various classroom supplies. Last year the gala raised $210,000 for scholarships and school programs. For almost 120 years, St. Martin de Porres School has been a stable and stabilizing presence in North Philadelphia. Drawing students from some of the poorest and crime-ridden areas of the region, the school has given its pre-K through eighth grade students an educational foundation that has enabled them to get into top high schools and colleges, giving back generously to their communities through service. In August 2010 the school became independent with the laity-led Friends of St. Martin de Porres School assuming the leadership and financial responsibility for the school. The board incorporated innovative business management practices with proven academic programs. In 2013 the school became part of the Independence Mission Schools, a network of 15 Catholic elementary schools in the Philadelphia area.